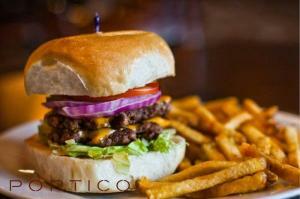 Portico is a local hotspot that offers a varied menu of burgers, comfort food favorites, and daily lunch specials. Outdoor dining is available on their covered patio and bar. Don’t miss specials like 2-for-1 burgers on Wednesdays, $5 sangrias on Thursdays, and live music on the patio every Tuesday night!